The Detroit Health Department recommends that all children in Detroit under the age of 6 be tested for lead every year. 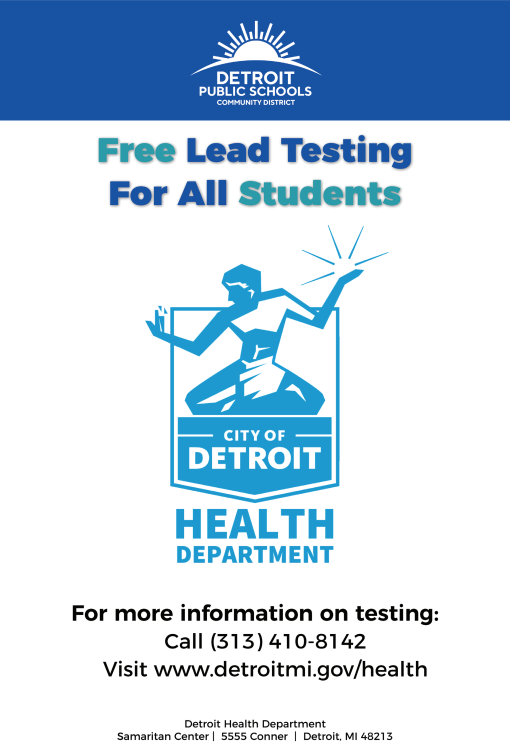 The Detroit Health Department provides free lead testing for all Detroit students at its Samaritan Center Clinic at 5555 Conner, Detroit, Michigan, 48213. Call 313-410-8142 to make an appointment or visit www.detroitmi.gov/health. Superintendent Vitti initiated water testing of all of our school buildings during the spring to ensure the safety of our students and employees. This was not required by federal, state, or city law or mandate. This testing, unlike the previous testing, evaluated all water sources from sinks to drinking fountains. On Aug. 24, results were returned for 24 schools and higher than acceptable levels were identified for copper and/or lead in 16 schools at one or more water sources. The District immediately turned off the drinking water at those schools and provided water bottles until water coolers arrived. When Dr. Vitti started as superintendent last year, he was notified that 10 schools were using a DiHydro filtration system. He made the decision to shut off all drinking fountains and provide bottled water and water coolers to those schools at that time because of concerns with water quality despite the intervention. The latest water results (16 schools), coupled with those from 2016 (10 DiHydro schools) and follow up results in the spring of 2018 for schools identified with concerns in 2016 (8 schools) in the spring, brings the total number of schools with water quality issues to 34. Although we have no evidence that there are elevated levels of copper or lead in our other schools (over 50) where we are awaiting test results, out of an abundance of caution and concern for the safety of our students and employees, Dr. Vitti instructed to turn off all drinking water in our schools until a deeper and broader analysis can be conducted to determine the long-term solutions for all schools. Dr. Vitti communicated this decision to the Mayor’s Office and the Mayor and his team are supportive of the decision. The Mayor’s Office plans to partner with us to determine challenges with water quality in our schools and solutions to them. We have communicated our decision to staff and families and will continue to communicate when students return to school. As you are aware, the District initiated water testing of all Detroit Public Schools Community District school buildings during the latter part of last school year to ensure the safety of our students and employees. This was not required by federal, state, or city law. This testing, unlike the previous testing in 2016, evaluated all water sources from sinks to drinking fountains. When the first round of results indicated 16 of 24 schools had high elevations of lead and/or copper, we turned all drinking water off in schools and provided bottled water and water coolers. We received the latest round of testing results, which follow the same pattern as the first round. 33 of 52 schools have elevated levels of copper and/or lead. This means, to date, that 57 of 86 schools where test results have been provided, elevated levels of copper and/or lead were identified (this does not include the previous 10 Di-Hydro schools where copper and/or lead was detected).We are still awaiting results for seventeen schools (A.L. Holmes, Catherine Ferguson, Palmer Park, Davison, Fisher Upper/Lower, Pershing) and the original 10 Di-Hydro schools. Staff have been informed of the results and the same will occur for families and students through an automated call home and a backpack letter home. Moving forward we will continue to use water coolers districtwide and are actively working through the bid processes to make a recommendation to the board for the use of hydration stations. This will occur within the next couple of weeks. 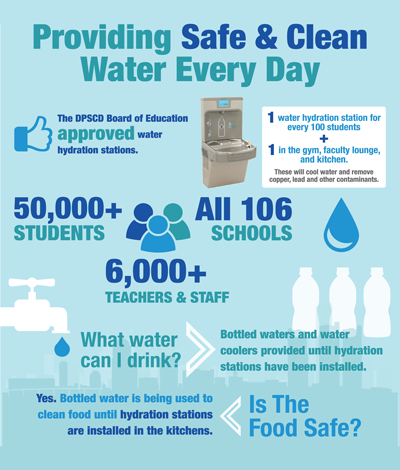 The hydration stations would be installed in all schools by beginning of next school year districtwide and replace the need for water coolers. A hydration station would be placed in a school for every 100 students, in addition to one in the kitchen, faculty lounge, and gym. Additional stations would be installed after the first year of implementation if consistent access is a challenge based on the configuration of the school’s building. Water test results are posted below. Below is a list of the 52 schools where water tests have been recently returned. In addition is a list of schools where previous test results were released followed by the results of schools with elevations.